Physicians across the country are seeing a marked increase in rickets cases among African-American children these days. Many attribute this rise in cases to the lack of sun African-American babies and toddlers receive because they’re indoors in daycare all day long, most days. Physicians are also citing WIC’s successful breastfeeding programs for the increase in rickets cases. While formula and most foods we eat are fortified with vitamin D, breastfeeding has no vitamin D at all. This simple fact, however, should not discourage you as a mom from breastfeeding your baby. Exclusive breastfeeding for the first six months of your child’s life does not automatically equate to rickets. Be sure to talk to your doctor and have him or her recommend a quality vitamin D supplement that you can take. If you’re on WIC, you can get this supplement for free in most cases. And if all else fails, be sure to spend ample time outside this spring and summer in the sunshine. Let the sun’s rays bask down upon you and your little one and you’ll be perfectly fine. In Other News: Uh-Oh! A Melbourne mom was groped while breastfeeding. Moms, be sure you’re careful when breastfeeding in public. I know this is an isolate d incident, but still exercise caution. The world is simply crawling with crazies! What a sight to behold! 3608 moms breastfeeding — at once. 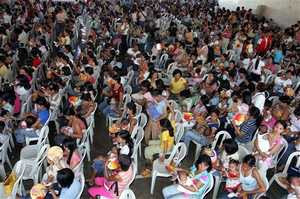 Breastfeeding keeps new moms happy (my words). A new study finds breastfeeding helps curb postpartum depression. One of the best breastfeeding positions is placing your baby on your tummy, a new British study finds. I always found this position to be annoying, but apparently it works for some.